Archive-Protest in Isfahan against the Iranian regime’s corruption and the declining economic situation. 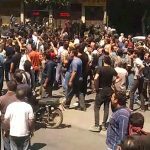 On Monday, August 13th, regime Supreme Leader Ali Khamenei finally broke his silence about the free fall of the rial and the swell of protests that have taken place across Iran since July 31st. His remarks made it clear that he has no solutions to the problems facing Iran. Khamenei blamed his own regime’s president, Hassan Rouhani, for the catastrophic economic situation in Iran, confirming rumors of infighting among the highest levels of the regime. Khamenei feigned ignorance about his own regime’s decision to plunder Iran’s wealth on nuclear missile programs and warmongering in the region. blaming these actions on Rouhani. Khamenei has a history of blaming others for his own failures. Khamenei spoke against protesters in June, blaming the MEK for anti-government sentiment, saying, ““Since day one after the revolution, hypocrite groups [the derogatory name regime uses doe MEK] have existed, making a stance against our Islamic state and… creating problems for us”. Khamenei spoke out once again on Monday about the recent protests that have shaken the regime to its core, breaking his silence for the first time since the newest wave of protests began on July 31st. He described the widespread protests as “August incidents, which despite enormous financial and political investment by the enemy turned out to be very limited.” The week-long protests, which took place in a number of cities in Iran, including Tehran, Karaj, Isfahan and Mashhad, were widely attended by people from all walks of life. 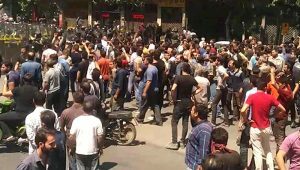 Chants of “Death to the dictator!” and “Death to Khamenei!” were heard on streets all over Iran. With these words Khamenei made it clear that any change to the regime would lead to regime change. Khamenei’s remarks proved once again how little regard he has for the will of the people. And his willingness to publicly blame his own government show that the regime is crumbling from the inside.